Dawn Kurtagich, like the Trees in Python, sucked me in with The Dead House. When I learned that she would be releasing another spine-tingling tale, I couldn't wait to get my roots hands on it! And the Trees Crept In will keep you up all hours of the night; both from not being able to put the book down and from being too spooked to sleep! Author, Dawn Kurtagich definitely won me with her eerie tale The Dead House but she definitely amped up the creep factor with this one! We are immediately plunged in the woods when Silla and Nori are escaping from their father's abuse. Hoping to find refuge at their Aunt Cath's manor, La Baume, or also (fittingly) called the "blood manor". Cath was such a whimsical character. There is a quirkiness to her that will make you fall in love with her instantly. She is wacky and wild, and her character comes alive and leaps off the pages! She reminded me of a cross between Nanny McPhee and Miss Peregrine. Silla is such a strong and complex character. There are many layers to her that unfold throughout the entirety of the novel. I adored her and the fierce love she had for her sister, Nori. Nori is another fantastic character. It was obvious the author crafted Nori with so much care! Nori deals with her own difficulties that I'll leave for you to discover for yourself, but Kurtagich did an outstanding job at delivering her dialogue. And the Trees Crept In is not penned like your average novel. Like the "blood manor", it is filled with nooks, cranny's and hallways that have all kinds of shadows and darkness lurking within them. It is a mind-bender and it will take you on one haunting adventure! I started reading this last night and haven't decided if I get it yet or not. I can't decide if it's modern day or not?? I mean, the girls are wearing jeans, but it feels historical. Also, there's a lot of random rhymes and stuff thrown in and I'm ready for all of that to make sense. Hopefully I get caught up soon because I want to be creeped out!!! Great review! 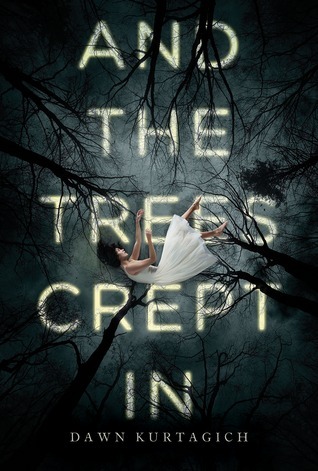 If you're looking for a book that will scare you in a creepy way, but will also let you sleep at night once it's over, please do yourself a favor and pick up And the Trees Crept In by Dawn Kurtagich. Then, come listen to our bookcast on it!